All transactions are safe and secure with a reliable history in online purchasing behind each of our associates. 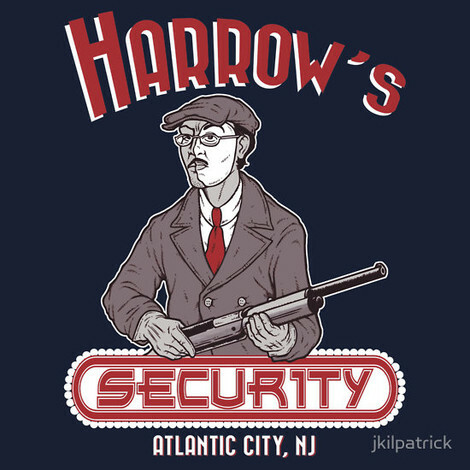 Buy the Harrow's Security t-shirt to own Boardwalk Empire clothing and merchandise. It was exciting to see this tee as the TeeFury selection of the day a few weeks back. As soon as I saw it, I was eager to feature it in the gallery. World War I veteran Richard Harrow is perhaps the most intriguing character on the HBO TV show. This illustration does a wonderful job at capturing his role in the series. Harrow has been Jimmy Darmody's sidekick and protector for much of the first two seasons. Injured in the war, he wears a mask that covers half of his face. In addition to his physical scars, he battles emotional wounds as well. In addition to the Harrow's Security tee above, browse the Boardwalk Empire Clothing Gallery for more apparel like men's and women's clothes, kids shirts or hoodies.